A Cornish village devastated by floods last year is holding its first ever food, arts and crafts festival. 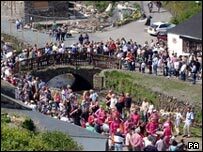 The three-day festival in Boscastle is being supported by local celebrities, including Cornish-born Olympic gold medallist Ed Coode. The festival starts on Friday night with entertainment in local pubs and a marquee deemed "the foodies' paradise" in the village car park. There will be cookery demonstrations and stalls selling local produce. A free park and ride scheme will operating from the Tintagel and Bude side of the village.